On August 31, the Japan Ministry of Defense (JMOD) released its defense budget request for Fiscal Year 2016. Having been submitted to the Ministry of Finance, the budget will be finalized by December. First, the FY2016 budget request that Western media labeled “record-high” includes the expenses to support the U.S. military presence in Japan—called “SACO (Special Action Committee on Okinawa)-related expenses”—including support for local governments that host U.S. bases. Simply put, the expense under this category does not contribute to enhancing the capabilities of the Japan Self-Defense Forces (JSDF) by investing in their weapons, etc. When you take “SACO-related expenses” out of the equation, the actual spending that JMOD has proposed for itself is approximately 4.93 trillion yen ($41.4 billion) — comparable to what Tokyo spent on defense in 2002. In short, even with three consecutive years of growth in defense spending, Japan has only recovered what it had lost in defense spending for the decade between 2002 and 2012. Moreover, even with defense spending restored to the level of where it was 10 years ago, it does not mean that Japan’s purchasing power is proportionally restored. The cost of defense acquisition keeps rising as Japan continues to seek state-of-the-art defense equipment, often used by the U.S. military (the F35A and Global Hawk are examples). As Japan looks to acquire more U.S. platforms, the weaker yen continues to constrain Japan’s purchasing power. Finally, one has to question the wisdom of continually discussing “Japan’s remilitarization” when China has been consistently outspending Japan on defense in recent years. 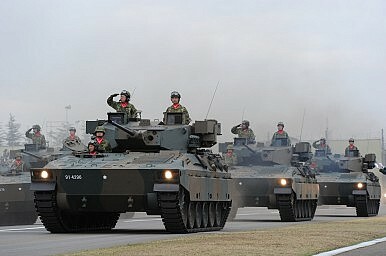 Given the developments in Japan’s neighborhood in the past year alone, it is a sound judgment on the part of the Japanese government to invest more in defense. Looking closely, one can see that Japan has made a conscious decision to invest in ways that will help buttress JSDF capabilities in the areas that are critical for effective homeland defense—robust mobility and C4ISR. These are areas where Japan has underspent for far too long and yet they are critical for Japan to take on greater (and appropriate) responsibilities in defending itself and cooperate more closely with the United States, within constitutional constraints. In short, Japan’s FY2016 defense budget proposal is not a sign of the resurgence of Japan’s militarism. Rather, it demonstrates Japan’s willingness to try to carry a fair share in its own defense. If anything, the United States, as Japan’s ally, should encourage it. Japan Debates Changing Its Pacifist ConstitutionJapan's Defense Reforms and Shinzo Abe's Image ProblemJapan’s Defense Ministry Seeks to Roll Back Civilian ControlJapan’s Defense Budget Swells to Counter China’s Growing Military ThreatIs Japan About to Officially Upgrade to Aircraft Carriers?